Sale second-row Sebastien Chabal has called on France to leave nothing behind in their quest for a win against Ireland in their opening Six Nations fixture. Chabal packs down in the French engine-room for the Croke Park showdown, and has signalled the need for the French squad to pick up a morale-boosting win and answer some of their critics. Coach Marc Lievremont's propensity for playing young and inexperienced players has infuriated many and led to the French effort being dismissed in certain quarters. 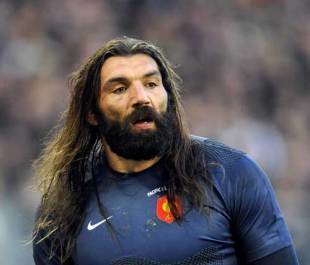 "We are lacking major victories that bring the squad confidence," said Chabal. "So the most important thing on Saturday will be to start the tournament with a win. We are telling ourselves it is not about the manner but about the result. "Even if we win by not being convincing with our play, it will give us some confidence and allow us to continue working in serenity. So we simply need to win and if we can discover our style of play, all the better." Lievremont has selected a back-line brimming with attacking intent, with Clement Poitrenaud, Yannick Jauzuin, Maxime Medard and Julien Malzieu all capable of lighting up the field. After a year of rotation however, they may look to the cohesive unit represented by Ireland's pack and see their downfall. "We know we can do a lot with the ball since we have a line of quite exceptional three-quarters who love to be on it," said Chabal. "But we still haven't succeeded in confirming our style of play. Either we have tried to play too much or we have tried to play on the counter, like against Australia (in the summer tour and in November). We have to find a middle ground. "They (Ireland) have the advantage of playing together every weekend and everything comes natural to them. It is always hard playing against the Irish. They don't play a lot and rarely come out of themselves. They rely enormously on stealing ball and they are capable of holding onto it for a long time, which can hurt you." After an autumn series that saw wins over the Pacific Islands and Argentina and a loss to Australia, Lievremont's France are still unsure of where they stand in the world game. "We can't wait for Saturday to see where we are up to," said Chabal. "We are working in continuity with almost the same squad as in the autumn. We have found our bearings and the combinations are getting better and better. We are doing well together."